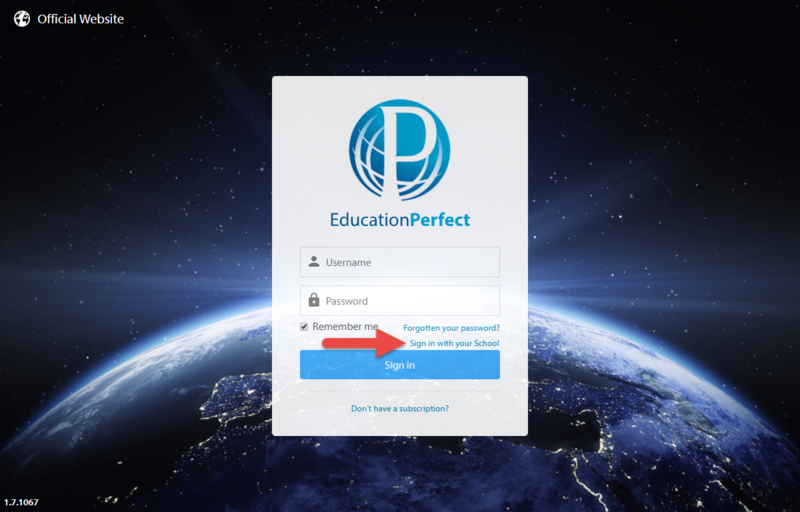 There are three ways to log into Education Perfect when SSO is enabled at your school: from our login page, through IdP-initiated signon, or by a URL specific to your school (not recommended). From either the student zone or Control Panel login page, click Sign in with your School, then type the name of your school and select it from the results. You will be taken to your school's login screen, where you can log in as normal; you'll be returned to Education Perfect when your login is successful. IdP-initiated signon is our recommended approach for programmatic access to Education Perfect, for example as an embedded link in an LMS. We are unable to provide specific assistance with enabling this, but have seen it successfully implemented with a list of target websites on your school's login page. If IdP-initiated Signon is not possible, contact us on support@educationperfect.com and we can give you a URL specific to your school to trigger a sign on attempt. This is only recommended as a fallback option, because if we make a change to our systems this URL might stop working.